One of my favorite things to come home to is a delicious supper that has been in the slow cooker all day. I decided to make Slow Cooker Spicy Marinara so I didn’t really go all out on this one, but I must say, it was one of the best marinara sauces I’ve had in a while (sorry Auntie)! I did my own little take on this recipe from Life Currents blog, but added some crushed red pepper and a nice glug of red wine because, well… um do you know me? I’m a firm believer in red wine really bringing out the vibrancy in a tomato sauce – and I think slow cooking the sauce for over 8 hours really allowed the flavors to develop beautifully. I’ve made a lot of pasta sauces for Nick, but I think this one was his favorite. I made a whole ton of this stuff because you can freeze it and it keeps FOREVER. I also thought about grabbing an Italian loaf to make some homemade garlic bread – but it isn’t really totally homemade unless you make the bread too, right? It dawned on me that I had just added a 5-minute Artisan bread recipe to my Pepperplate account so I decided to try it out. I failed to get a picture of the bread itself, but in the picture below, you can see the final product – Herb and Cheese Garlic Bread (obviously not vegan, but can easily be made vegan with shredded Daiya cheese). I made a VERY small loaf so I only let it rise about an hour before tossing it in the oven and still came out delicious and golden-brown in color. I made a ton of more dough, so expect to see a picture of one these beauties in the near future. Place all ingredients in the slow cooker. Stir well to combine. Secure the lid on your slow cooker and cook on low for 8 hours or high for 6 hours. Stir the sauce and remove the bay leaves. Taste for seasonings, adding more salt and some freshly ground pepper as desired. That looks absolutely AMAZING!!! 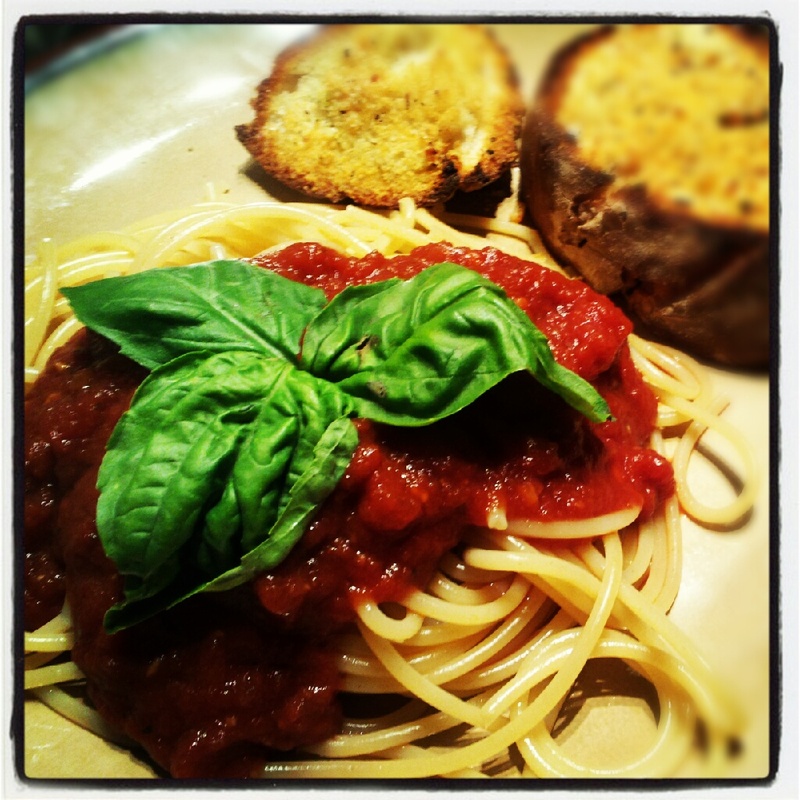 I’ve never really made a fancy marinara sauce before! I just whip up something fast on the stove. This sounds so good though!! It really is! Allowing it to slow cook made the house smell so yummy! 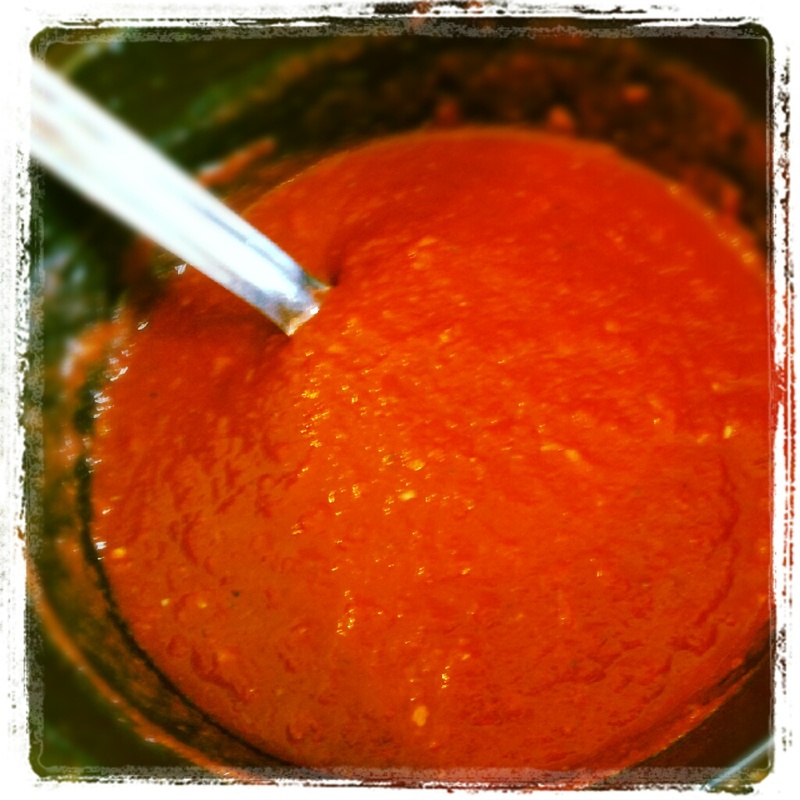 the art of cooking a sauce… fantastic. sadly I do not own a slow cooker, but still – this one sounds lovely! My god, this looks SO good! I canNOT wait to try this recipe! My cousin’s wife suggested making sauce in a slow cooker – I like to cook my sauce sit for 5 or 6 hours on the stove – but it’s a PIA to have to constantly stir it every 15 or 20 minutes. 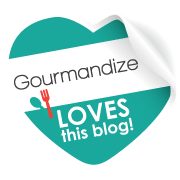 So I tried the slow cooker method – I LOVE IT! I do find I stil need to saute my onions and tom paste for 10 minutes over the stove before putting it in the slow cooker with all my other ingredients (except the spices – I wait until I have about 3 hours left then add all my spices so they don’t cook away). BEST SAUCE MAKING METHOD EVER!